Rhys Enoch plays in the Sunshine Tour's final event of the 2017/18 season this week at the magnificent Serengeti Golf and Wildlife Estate. Rhys qualified for the event by finishing in the Top 50 of the Sunshine Tour final ranking list, a position he achieved although he only competed in 7 events all season, the highlight of which was the stunning victory at the Cape Town Open 2 weeks ago. Rhys Enoch made a stunning birdie on the final hole to claim his maiden 72 hole tournament victory at the Cape Town Open by 1 shot on the Sunshine Tour. Rounds of 64,69,67 and 69 saw Enoch home with a total of 19 under par for a 1 shot victory of Peter Karmis from South Africa. and also qualifies for the Tshwane Open at the Pretoria Country Club this week, this event is also a co- sanctioned tournament with the PGA European Tour. 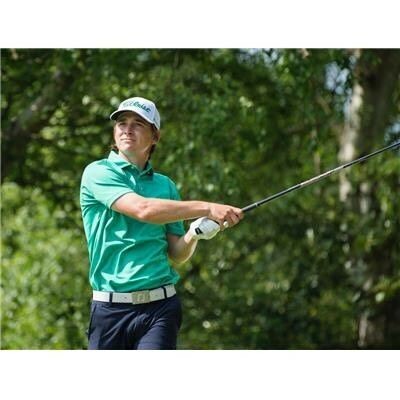 Blackstar Golf today announced that the Worcestershire based lighting manufacturer Green Lighting are to become an Official partner to Oliver Farr in 2018 as he returns to the European Tour. Ollie finished 6th on the 2017 European Challenge Tour rankings to regain his full playing status. In addition they will also sponsor James Maw and Worcestershire's Ben Robinson. In 2018 Oliver will play in approximately 30 events visiting more than 20 countries, the tour finishes at the DP World Championship in Dubai in mid-November. Green Lighting is a leading designer and manufacturer of innovative LED lighting solutions and for nearly two decades have supplied cost effective lighting through specification, to the UK house builder. Green Lighting offer a unique route to market, providing full traceability and also offer award winning customer care warranties. The Bridgestone Challenge will again be staged Luton Hoo Hotel, Golf & Spa in September, the pre event Pro Am takes place on September 5th, and the professional event runs from September 6-9. Race To Dubai opens with the South African Open. Oliver Farr returns to the 2018 Race to Dubai this week at the 107th South African Open which will be played at Glendower Golf Club. Australian PGA Championship in December. with the highlight been his 5 shot vitory in China at the end of the 2017 season. The 2018 schedule will see Oliver play in excess of 25 events across the world. The SA Open starts on Thursday January 11th, and you can follow Oliver's progress via live scoring on euroepantour.com as well as @blackstarsports on twitter. Stuart Manley finished T42 and Oliver Farr T49 at the Joburg Open. This was the last event for Blackstar players in 2017. Thank you to everyone who has been in involved with Blackstar this year,not only with the players but also all the sponsors and volunteers of the 2017 Bridgestone Challenge. Welsh duo Stuart Manley and Oliver Farr both play this week at the Australian PGA Championship, this is a co- sanctioned event between the European and Australian Tour, and is the second Official event on the 2018 Race To Dubai. Ollie Farr who represents Burghill Valley GC in Herefordshire followed up 3 consectative Top 10 finishes by winning the European Challenge Tour's biggest event, the Foshan Open in China by 5 shots, rounds of 69,66,66 and a final round of 69 saw him finish on 18 under par. Ollie now moves to 4th on the latest Race To Oman rankings and with only 2 events left on the 2017 Challenge Tour and the Top 15 players graduating to the 2018 European Tour,Ollie has now guaranteed a return to the main tour. In addition he has now moved up to to 264th in the latest World Rankings. David Boote, who represents Walton Heath Golf Club safely negotiated his way through stage 1 of the European Tour's Qualifying school. Scores of 69, 72, 73 and 71 had Boote finish with a 3 under par total at Frilford Heath Golf Club. Stage 2 will take place in Spain in early November, and the final school comes staright after at Lumine Golf Club. In total there are 14 rounds and at the conclusion of the final school the top 25 players will gain a full exemption on to the 2018 Race To Dubai. 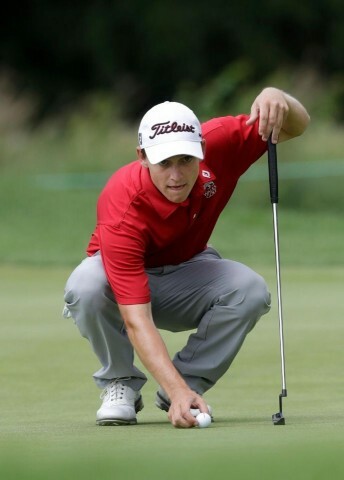 The Stanford graduate has had an impressive amateur career, reaching a career high of 24 in the Official World rankings. Jeremy Robinson of BlackStar said, " We are delighted to have signed David, this year he has played in the Walker Cup and narrowly missed out on qualifying for both the Open Championship and also the US Open, he begins a new chapter now in his golfing career and we hope that we can help him achieve his goals as a tournament professional "
With just over 1 week to go until the 2017 Bridgestone Challenge at Luton Hoo Golf Hotel & Spa Pre Event registration is still available at www.blackstagolf.net. Every fan who pre registers for the event and attends one of the tournament days will be entitled to claim vouchers with a value of up to £200, and this includes a FREE round of golf at Luton Hoo Hotel Golf & Spa. Each day of the event has a " theme " to it, Thursday September 7th is Schools Day, September 8th will be Ladies Day, where every lady who attends the event will be entitled to a FREE glass of wine, Saturday is Family Day and the Sunday September 10th will be " Championship Day ". The Bridgestone Challenge will be the first PGA European Challenge Tour to use a Modified Stableford Scoring system with the player at the end of the week with the most stableford points becoming the champion, this will hopefully encourage the players to take more risks with the emphasis been on making birdies and eagles during the 4 day event. Stuart Manley and Michael Hoey both play in the Porsche European Open in Germany this week. Robert Karlsson hosts his own event this week on the Challenge Tour, where Oliver Farr, Martin Rohwer, Rhys Enoch and Richard James are competing. Stuart Manley makes his debut at the 146th Open Championship this week at Royal Birkdale, Stuart qualified for the event courtesy of finishing 2nd at the 2017 Joburg Open earlier this year on the European Tour. 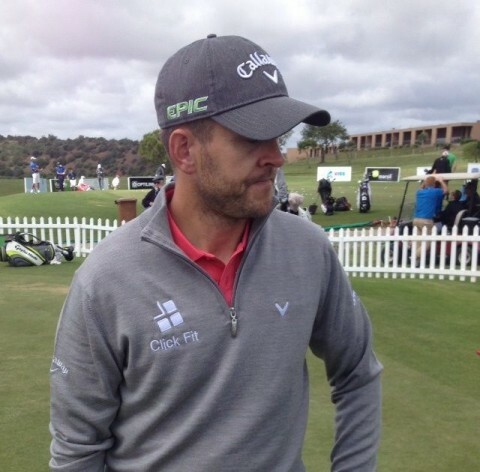 Stuart who is sponsored by Worcestershire based ClickFit also teams up for the Open with Gateley PLC. Blackstar Sporting Events Ltd are delighted to announce The Club as the Bridgestone Challenge's official media partner. The Challenge Tour event will be played at the stunning Luton Hoo Hotel, Golf & Spa near Luton from September 7-10, with a pre-tournament Pro Am on September 6th 2017 and will showcase some of Europe's finest up and coming golfers. Uniquely the tournament will be a modified stableford format and entry to the event will be totally free. Not only that but every fan who turns up will be eligible for £200 worth of vouchers, which includes a free round of golf on the fantastic Luton Hoo course! Jeremy Robinson Director at Blackstar said: "We're delighted to partner with The Club. Golf media is changing and these guys are at the forefront. In 2017 people are on social media and these guys are the biggest in golf, in Europe. "The tournament will have some fantastic players on show and the fact that every fan coming to the event can sign up for the fantastic vouchers we think is a great offer. We just needed to get that message out and there is nobody better placed to do this than The Club." Last year's Bridgestone Challenge was won by Belgian Thomas Detry by an incredible 12 shots and he is already making waves on the European Tour and tipped for very big things. Ryan Curtis, founder of The Club said: "We're buzzing to partner up with this event. They're trying a new format, it's free and easy to get to and you even get a totally free round of golf on a great course. I actually don't know why any golf fan wouldn't pop down! 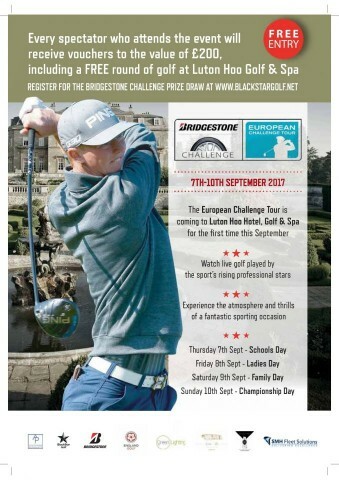 To get tickets and to be eligible for £200 worth of vouchers including the free round of golf at Luton Hoo simply register at https://www.blackstargolf.net/bridgestone-challenge/prize-draw-registration. The 2017 Bridgestone Challenge is now only 8 weeks away, golf fans can now register for £200 of vouchers, which includes a FREE round of golf at Luton Hoo Hotel Golf & Spa and FREE entry to the event. In addition to this offer there will be a Prize Draw on Sunday September 10th for all spectators who attend any day of the event, prizes will include a nights accomodation at Luton Hoo Hotel, a set of tyres from Bridgestone, wine from Bordeaux Undiscovered. Come and watch some of the future stars of world golf, players such as Brooks Koepka, Henrik Stenson, Martin Kaymer and " Beef " have all gradutaed from the PGA European Challenge Tour in recent years. 23 year old Martin Rohwer from South Africa makes his debut on the 2017 PGA European Challenge Tour at the Hauts de France Golf Open, he is joined in the field by fellow BlackStar players, Chris Selfridge, Ben Robinson, Rhys Enoch, Michael Hoey and Richard James. 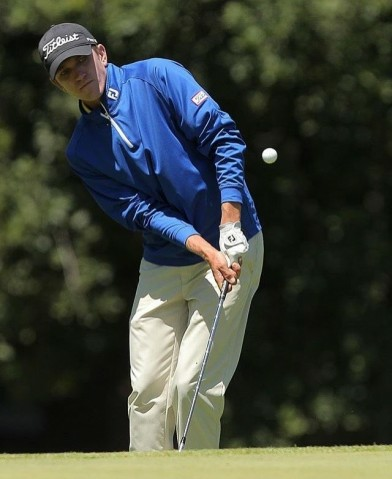 Martin turned professional at the end of last year, having graduarted from the University of Alabama, Birmingham. This week the European Tour goes to Austria for the Lyoness Open Powered By Organic, the Welsh duo of Stuart Manley and Oliver Farr are both playing this event. Manley is currently in the top 100 of the Race To Dubai after his 2nd place finish at the Joburg Open earlier in the season, and Ollie is coming of the back of a 4th place at the Czech Challenge 2 weeks ago. The Challenge Tour is in Belgium for the KPMG Trophy at the famous Royal Waterloo GC. Richard James returns to action for only his 2nd event of the season after having surgery earlier in the year. Also playing is Michael Hoey from Glagorm Castle,who has already had 3 top 10 finishes on both the European Tour and the Challenge Tour this year, he is joined by fellow country man Chris Selfridge. Ben Robinson from Worcester GCC and Welshman Rhys Enoch are also in the field.